Researchers at Northland College in Ashland and a former student found that New World flying squirrels glow under UV light. Photo courtesy of Kohler et al. Fireflies, jellyfish and glow sticks all, well, glow in the dark. Now, scientists are adding squirrels to that list. Researchers at Northland College in Ashland recently published a study in the Journal of Mammalogy claiming three species of flying squirrels glow pink under ultraviolet light. Lead author Allison Kohler was a Northland student when her professor Jon Martin came across the unlikely discovery while doing a forest survey in his backyard with a handheld UV flashlight. Researchers at Northland College in Ashland recently published a study that three species of flying squirrels glow pink under ultraviolet light. Photo courtesy of Kohler et al. "Everyone was pretty skeptical when they heard this," she said. "Because who has ever heard of a glowing pink squirrel?" Kohler, now a graduate student at Texas A&M University, said Martin asked her to develop a project to investigate. To find out more, they went to the Science Museum of Minnesota and the Field Museum in Chicago to check out the specimens on display. "Every single one of them that I saw fluoresced hot pink," she said. 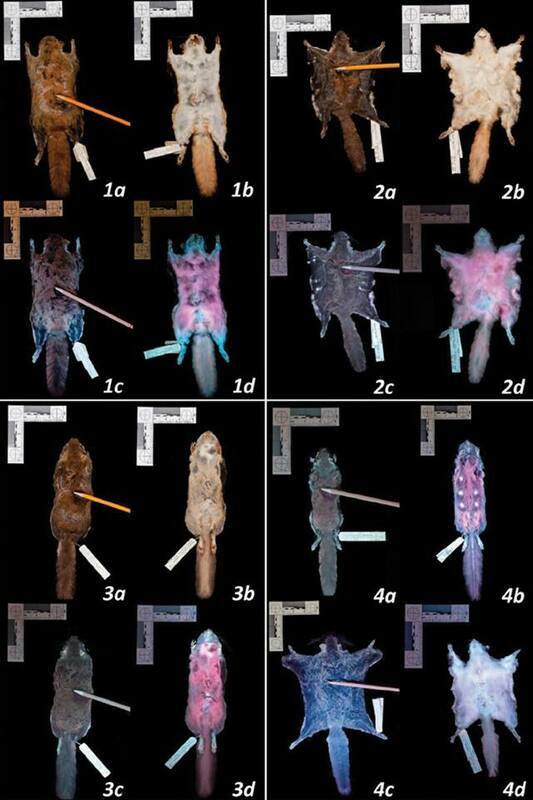 The researchers examined more than 100 squirrels from different species and found the northern, southern and Humboldt flying squirrels all fluoresced under UV light. The reason why remains a mystery, Kohler said, noting more research is needed. Still, they have a few ideas why these squirrels glow in the dark, and it may be related to their environment. New World flying squirrels are most active at dawn and dusk, which is also when UV wavelengths may dominate. Kohler said the fluorescence could be related to the snowy environment they inhabit throughout most of their range, which includes forests across Canada and the northern United States. They also hypothesized it could be a way to communicate with other flying squirrels as they glide through the trees or a way to show off as "sort of a sexual selection display." Kohler said squirrels might also glow pink in UV light to evade predators. "For example, there are some owls that happen to have the same fluorescent glow and the same color and they live in the same area," she said. "They have the same habitat so the squirrels could be trying to mimic them and avoid being eaten by these different animals." Squirrels and owls aren’t the only animals known to glow under UV light. The phenomenon has been observed in plants, spiders, fish and other species. Opossum have been known to fluoresce, but it hasn’t been widely documented among mammals. Kohler said they're not encouraging people to test out UV light on live squirrels since it's unclear what impact it will have on them.